With McLibel shortly to be screened on BBC2 as part of a season of flagship modern documentary works under the Storyville banner, Slarek looks at the work of Spanner films, and talks to director Franny Armstrong about its past, present and future, and the long process of getting no-budget documentary to a national audience. Only the most half-aware filmgoer can have failed to notice that the documentary feature film is back in vogue. Well, 'back' is probably pushing it a bit, as although feature length documentary works have been with us since the early days of cinema, you would be pushed to find a period when the format was finding the sort of widespread appeal that it has enjoyed in the past couple of years. Even in the heyday of cinéma vérité, a documentary feature would be very fortunate indeed to reach the sort of audience that flocked to Fahrenheit 9/11 and its ilk. Of course, timing is key here. It's impossible to overestimate the importance of the digital video revolution, drastically reducing the cost of production and yet delivering a quality that survives the blow-up to 35mm film for cinema projection. But wider access to production equipment in no way guarantees a mass audience – without interest from a distributor or a broadcaster, any documentary, no matter how important its subject or how well delivered its message, remains incomplete simply because it has not been allowed to connect with its target audience. Bowling for Columbine may well have been the right film in the right place at the right time, but its knock-on effect is still with us two years later and shows little sign of abating. Last year, for the first time I can recall, ALL of the films nominated for the Best Documentary Oscar received very visible UK cinema releases. OK, they may not have been sharing screen space with the likes of Troy and The Day After Tomorrow, but they were out there in cinemas across the UK and they were getting SEEN. Which all seems well and fine, but there's just one thing – fine films though they are, the vast majority of the most widely distributed, seen and written about documentary features of the past two years have originated in North America and have dealt with American issues, even if some of them have global implications. Of course American films are always seen as more marketable, a trend reflected in mainstream cinema, but given the historical importance of the British Free Cinema documentary movement of the 1950s, you'd be forgiven for wondering where the British films are in this new popular wave. Their absence is felt not only in the cinema but on TV, as serious investigative and political documentary works give way to trivial sensationalism and the gladiatorial confrontations of increasingly celebrity-driven reality television shows. For some time now, the film and television establishment have seemed largely uninterested in films that tackle difficult or unfashionable subjects in any real depth, and the doors of both effectively remain closed to anyone wanting to make such a work and get it screened. So it is a bold and determined person who elects to dedicate what can prove to be several years of the life to creating such a work, armed only with what money they can throw in themselves or beg from friends in the uncertain knowledge that, once complete, there are no guarantees that anyone will actually show it. Enter Franny Armstrong, who back in 1995 had no ambitions to be a film-maker, but on hearing of the extraordinary story of Helen Steel and Dave Morris, two London Greenpeace campaigners who chose to take the might of the McDonald's corporation in what was to become the longest civil trial in English legal history, she borrowed a camera and, with no money and no film-making experience, began documenting the case and following the trial to its uncertain conclusion. 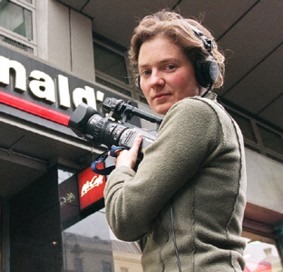 She even persuaded veteran director Ken Loach to come on board and direct the courtroom reconstructions, a necessary aspect given the refusal of McDonald's to allow any of their own witnesses to be interviewed on the case. The completed film, McLibel – Two Worlds Collide, told a tale that was both illuminating and inspiring, the sort of film guaranteed to attract an audience, you'd think. Yet no-one seemed prepared to screen it – the fear of the McDonald's legal arm was still strong and the list of those who had folded under the threat of legal action was lengthy and depressing, and included some of those who were spouting all manner of unconvincing reasons why this film would not really be of interest to their viewers. The film was actually scheduled at different times for transmission on both the BBC and Channel Four, but both screenings were cancelled and McLibel began to take on the air of a banned film. Ever determined and seemingly a glutton for punishment, Armstrong had in the meantime founded Spanner Films, which she continues to run with producer and all round technical and artistic contributor Lizzie Gillett. With McLibel complete but still fighting for distribution, Franny launched into her next project, Drowned Out, another remarkable tale of resistance in the face of corporate might, this time a small group of Jalsindhi villagers who refused to be relocated to make way for the Indian government's massive dam-building project. Again it was made with no money and no commission and was fuelled almost entirely by Armstrong's passion for her subject and the willingness of others to give their time for free. If you work for Spanner Films, it seems, you do so not for any financial reward, but because you believe in the project and what it is trying to say. As one of the camera operators on McLibel said: "Most films I do for my bank balance, but this film I do for my soul." They followed this with Baked Alaska, an examination of how some of America's wealthiest citizens are getting rich on the back of oil profits in Alaska, the USA's second largest oil producing state, while the local populace are suffering because the area is warming ten times faster than anywhere else in the world, thanks to climate change caused by automobile petrol fumes. At a time when the British political documentary seems to be almost an extinct species, Spanner films appear to be carving themselves a very distinctive and socially concerned niche. Actually getting the films screened has always been the prime concern for the Spanner Films pair, and with broadcasters and distributors unwilling to take the works on, they have taken to pushing the films themselves in a variety of formats (you can even watch them on-line on their web site), including an organised 'global screening' for McLibel after it was pulled from UK TV transmission, where it received 104 simultaneous screenings in 22 different countries. As a result, despite having no distribution deal, they estimate that a staggering 26 million people have seen the original cut. A recut of Drowned Out featuring a 'what happened next' ending received a US TV screening, and yet there was still no interest from the TV companies in the very country in which these films were made. In the end it was the work that first turned Franny Armstrong into a film-maker that was to finally change all this. In 2004 Helen and Dave took their case to the European Court of Human Rights to directly challenge the UK's libel laws and won, providing a triumphant ending to their story and Armstrong with the material to expand the original 53 minute version to feature length. And what do you know, with McDonald's no longer suing people left, right and centre and a successful challenge made to the UK's imbalanced libel laws, the BBC, who had repeatedly rejected the idea of commissioning the film and pulled the first cut from a proposed screening, agreed to show it after all under BBC4's prestigious Storyville banner. The response from those who saw it was, if the BBC's on website feedback is anything to go by, enthusiastically positive. "Almost everybody who's seen the film who I've spoken to has said, 'Oh it is possible, ordinary people can change the world'," recalls Armstrong. "But I remember one person saying to me, 'Oh it's all hopeless, what's the point of fighting?' And I said to them 'How can you say that? You've just seen Helen and Dave, they've struggled and struggled and they did win, they did achieve the aim.' And then the person I was talking to said, 'Yeah, actually you're right! What more evidence do I need?'" What indeed. Following its two showings on BBC4, the film is likely to find an even larger audience when it is re-screened on BBC2 on June 5 as part of a Storyville season featuring six flagship modern documentary works, alongside the likes of Errol Morris's Oscar winning The Fog of War, Keith Fulton, Louis Pepe's Lost in La Mancha, and Nicola Philibert's Être et Avoir, a rare documentary box-office hit in its native France. And so ten years after receiving the first rejection letters from the BBC, Franny Armstrong gets to see the film she believed in so passionately and gave so much of her time to held up by the very same corporation as an example of the modern documentary at its finest. "I have to admit to feeling a deep sense of satisfaction that the story I always believed in for all those years, literally for a decade, is finally going to get out to the public," said Franny of the screening. "In great numbers people in this country are finally going to hear Dave and Helen's story, and hopefully every single person will be as inspired as I was when I heard it and hopefully will take action. Obviously not everybody can make films but everybody can do something." Franny points out that in many ways her own struggle to get the film shown has suffered the same peaks and troughs as the tale it tells. "It's funny, I do think my story mirrors Helen and Dave's as well. They kept believing in it and kept fighting and they didn't win the original trial and I didn't win with the original film. Then they win in Europe and finally it looks like McLibel is going to go mainstream." She is also clear about one of the reasons for the BBC's apparent about-face on screening the film: "I think the whole climate has changed since 1997 and the original McLibel trial. The success of films like Super Size Me and The Corporation and books like Fast Food Nation and No Logo show now that people can really do proper investigative muckraking work about big corporations and not get sued for libel. And that's a huge difference when you think about all the different people, everybody who was sued pre-McLibel, everybody from the BBC to the Sunday Times, to the Guardian and trade unions and everybody had backed down, and now it seems to have completely turned around. McDonald's haven't sued anybody since, apart from one Italian food critic*. And it looks like everybody's feeling very encouraged by Helen and Dave's stand, and it's really opened the floodgates for criticism about corporations." With McLibel finally connecting with a more mainstream UK audience, it is worth noting that both it and Drowned Out are also available on Spanner Films' own feature-packed and comprehensive DVDs, disks that easily outshine the vast majority of big studio releases. Typically, these were created in-house with the help of willing and talented volunteers, and once again the process of doing so was learned not by studying other examples of the format, but just by doing what seemed right for the release. That it took something like eight months of work to create each of the DVDs is another example of the team's dedication to their work, and it shows in the quality of the disks, which are very professionally presented and crammed with information on their subjects, all of the multitude of extra features building on and complimenting the information supplied by the films. Though the do-it-yourself approach a hugely time consuming process, Franny sees definite advantages in it: "It was good, I think, because we didn't really know how to make DVDs and we weren't constrained by the normal boundaries. I hadn't even seen that many DVDs to be honest. The way we made the menus, for example, is apparently extremely unusual, just having more and more and more CVs linked up to each other and all that kind of thing. It seemed quite logical to us, but to people who make DVDs we've done it in a very illogical way, from their point of view." "Sometimes when there's an important subject that you're interested in and there's a documentary on it on TV, you might not be quite in the mood or if it's a big heavy subject, it might not fit in because you might be going out or whatever, whereas if it's at the cinema it's more of a commitment, and once you go in there and you pay your money then you're definitely going to watch it. And in a way I think the cinema is a better location for watching these big issue documentaries, giving them your whole concentration and committing to seeing it, rather than TV, where you've got phones ringing and people coming and going and that kind of thing. So I think that when people go…it is a better experience and certainly I much prefer seeing documentaries in the cinema." With McLibel now starting to get the more widespread recognition it deserves, are the days of struggling to make films on no money finally over for the enterprising pair at Spanner Films? There is still hope that Drowned Out will be picked up for a more widespread UK screening, and Franny does not rule out the possibility of revisiting and reworking the film, McLibel style, especially given how closely the two stories mirror each other – as with the McLibel case, the villagers featured in Drowned Out very recently scored their own post-original-film victory against a mighty opponent when they successfully challenged the original Supreme Court ruling on their resettlement, effectively winning against the Indian government. These similarities are not lost on Franny: "I've always thought that Narmada was McLibel in India. No, it really is." Their next film is Crude, which Franny describes as being about "oil and climate change and the end of the world." Structured as a five-angled examination of the oil industry in the mode of Steven Soderberg's Traffic, it is again being made without a commission, but this time Franny is working with John Battsek, the producer of Kevin Macdonald's Oscar-winning One Day in September, and has raised funding for the film by selling what effectively amounts to shares in the production – for £500 you could buy 0.5% of the film and its future profits. This proved a very effective way of raising a budget, with almost a hundred such shares being sold, giving the film a starting budget of £50,000, an almost luxurious position given the conditions under which Spanner's previous films have been made. "It's worked out really well," said Franny, "and we've had people making syndicates at their work and football teams and that kind of thing to get one share, and if I could finance all my films like that, that would be absolutely perfect because then it's a collective effort. People who've got a few spare quid can put it to something useful and also feel involved in the film." All of which sounds optimistic for the future, but Franny is uncertain about what lies beyond Crude, and even if she will continue to make films. She became a documentary film-maker not as a career choice, but because she was drawn to a story that encapsulated many of the things she was passionate about and felt a need to tell it to as wide an audience as possible, and making a documentary seemed the logical path to that end. But shooting and editing a film of this type, especially on no money, requires an extraordinary amount of work, time and dedication, often at the expense of everything and everyone around you. It may well be that after Crude is complete, Franny Armstrong, documentary film-maker, will return to her first love, music, and resume her career as a drummer. The increasing number of those who have been impressed by her film work may wonder if there is a way of combining the two, but Franny points out that film-making at this level excludes just about anything else. "Even boyfriends," she laughs. "They go by the wayside. It's just so intense making a documentary and it's so obsessed that you can't really do anything. Every time I finish a film I have to buy all my friends back, basically." It's difficult, though, to imagine someone of Armstrong's commitment to her stories being able to turn her back on film-making permanently. You can't help but feel that whatever she ends up doing, sooner or later a headline will catch her eye and trigger that need to document the story and tell it to others that seems to drive her on, despite the difficulties of even getting the film made, let alone shown. After all, as both McLibel and Drowned Out all too clearly demonstrated, no matter how impossibly imbalanced the fight may seem, a humble David can take on a corporate Goliath and win, and despite the odds, one person really can make a difference. * The critic in question was Edoardo Raspelli, critic and commentator for the Italian newspaper La Stampa, who likened McDonalds' burgers to rubber and its fries to cardboard.